that showcase your Half Square Triangles and How you Hang your Quilts. I found a wonderful archive to highlight today...it's our blogging buddy Deana, from Dreamworthy Quilts! Be sure to grab yourselves a highlighted button today as you've earned it after finding those "gazillion HST's" you shared today! I recognize Deana's Star Crazy quilt. I started that BOM, too, but only got about half way through. I had enough blocks done to make a throw as a wedding gift and a small wall hanging to keep. If you are a Farmer's Wife dropout, I'm a Star Crazy drop out! I'll be interested in the hanging tips too. 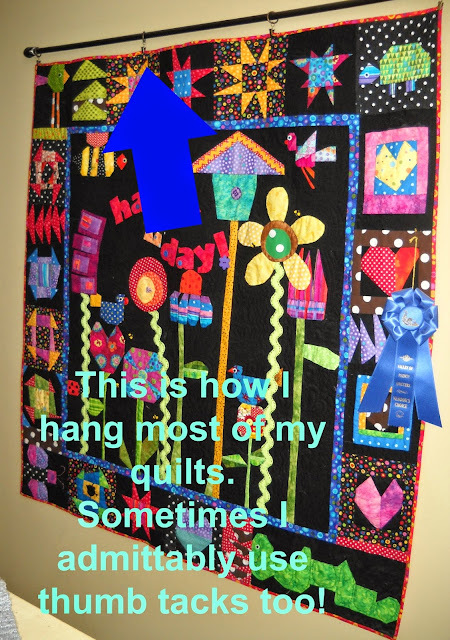 I don't make sleeves on my quilts I hang, but on those I sell I do and I don't know if I am doing it right or not! I make mine in 2 parts so there is open space in the middle so they only have to put one nail in the wall. Now I can't even take a pic right now as all mine are out at craft shows! I had done a sleeve some years ago to hang a quilt, it was easy but there was a special technique that I don't remember... let's see what everybody is doing! Thank you Val! Hooray! I was featured by the famous "Valerie"! Thanks Val! I needed a reminder about this quilt so I can "git 'er done". I wish I had time to write about the hanging sleeves I do with pictures - sorry! I hang my quilts the same way you do Val since most of mine aren't meant to be hung at all. I just like the way they look on the wall . I stopped putting hanging sleeves on the back when I stopped putting my quilts in shows, too much trouble. I'm always looking for a better way to hang a quilt so I'm interested to see how others do this. I hate to make hanging sleeves. I use a variety of other ways, including yours to hang my quilts. I like your approach to hanging quilts. It makes it easy to change them out.